According to one AARP survey, roughly 90% of American seniors wish to live at home for as long as possible. Seniors vastly prefer aging in place to facility care, even in cases where physical or cognitive decline makes it difficult to live independently. At Visiting Angels®, we know how much elderly adults value living at home. But given the challenges of aging, we also know how hard it can be to choose between aging in place and senior living facilities. This decision is easier for many families when they’re aware of how living at home benefits seniors. Seniors who age in place enjoy a sense of independence and comfort that only home can provide. They also enjoy better health outcomes on average, despite lower care costs. Here’s a closer look at four reasons why home is so important to seniors’ quality of life. Maintaining Independence. Age-related physical and cognitive decline can make day-to-day life difficult for seniors. At a certain point, elderly adults need help from others to accomplish everyday tasks. At this point, total independence is no longer possible. But with help from family, friends, and professional caregivers, seniors can maintain aspects of independence while still living at home. Most important of all, elderly adults have control over their routine, activities, and life decisions. This kind of independence isn’t possible for elderly adults who move to senior living facilities. In these facilities, residents have reduced control over their lives and routines. Many seniors become dependent on nursing staff, who are forced to split their time and attention between multiple residents. By aging in place, seniors can maintain a greater degree of personal independence. They are able to live their lives as they see fit, and they enjoy a sense of dignity unavailable to many elderly adults. Familiar Setting & Routines. The phrase, “home is where the heart is,” might be a timeworn cliché, but its sentiment remains as true as ever. A person’s home is the most important place in their life, offering a sense of familiarity, comfort, and security. For many seniors, the emotional value of home is far more important than its monetary value. Elderly adults cherish having a space that is truly their own — a space that doesn’t simply act as a home but actually feels like one. While some seniors quickly adapt to facility living, many seniors never truly feel at home in a nursing home or assisted living facility. Aging in place, meanwhile, allows older adults to stay in a familiar and cherished space. This is a critical and underrated factor in seniors’ quality of life. Healthier & Safer Environment. In a large share of cases, seniors choose to live in nursing or assisted living facilities because they believe this will be safer and healthier than living at home. While true in some cases, this belief is often unfounded. Several studies have found that nursing home residents have worse health outcomes than seniors who choose to age in place, even if seniors are in similar health. There are several factors at play here. One is the emotional toll of leaving home. Homesick seniors are at higher risk of stress and depression, both of which accelerate physical and cognitive decline. Another reason is the risk of infection. Studies have shown that nursing home residents are at much higher risk of bacterial and viral infections, including life-threatening infections such as pneumonia. Aging in place tends to improve seniors’ quality of life, which improves their physical health. It also insulates them from the bacterial and viral risks found in senior living facilities, reducing their chance of contracting a serious illness. Cost-Savings of Living at Home. Nursing homes and assisted living facilities are often too expensive for seniors and their families. In an assisted living center, a bed in a shared room will typically run between $10,000 to $20,000 per year, while a private room can cost upwards of $75,000. These costs can climb even higher in nursing facilities when seniors require specialized care. Aging in place also comes with a price tag. Many seniors need to modify their homes to make them safer and more livable. In a number of cases, seniors also need to hire an in-home caregiver to assist with light housekeeping, routine errands, or activities of daily living. Despite these costs, aging in place is typically less expensive than living in an assisted living or nursing facility. According to the US Department of Housing and Urban Development, seniors who choose to age in place can save thousands of dollars per month in care costs. Do you have a loved one who could benefit from aging in place? 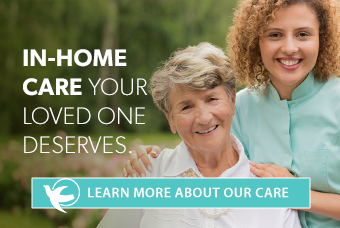 Visiting Angels makes life at home easier for seniors through customized home care solutions. Call us to learn more about our services, or contact your local office to request a free in-home consultation.